Samantha is model turned film actress who appears in South Indian films. Miss Malabar Avanthika is a model turned actress, who mainly works in the Malayalam and Tamil film industries, she pursued modelling before becoming an actress. During her modelling career, she appeared in a number of commercials. Avanthika hails from Calicut Kerala, She won Miss Malabar 2011 Title. Asin and Akshay Kumar at the Khiladi 786 Music Success Celebration Youth Concert at Mithibai College. A week of multi city partying would create waves in Hype, Mumbai; Stone Water Grill, Pune and Cafe 1 Boulevard Bar, Delhi. Zee Café has adorned a never-before bold avatar with its new show Californication, a show loaded with sardonic wit and adult entertainment; premiering on Zee Café on 25th July at 9 PM. The show is about protagonist Hank Moody’s David Duchovny sexual appetite that infects women, who indulge in all kinds of naughtiness too. Zee Café is turning bold and FHM’s association, being quite unapologetic about it. CALIFORNICATION Nights will be studded with celebrity guests in Mumbai, Pune and Delhi. CALIFORNICATION Nights will be studded with celebrity guests like Aftab Shivdasani, Bunty Walia, Aanchal Kumar, Riya Sen, Dino Morea, Rocky S, Vinay Pathak, Cyrus Sahukar, Angad Bedi, Bani, Rannvijay, Daboo , Shibani Dandekar, Shibani Kashyap, Ashish Raheja, Amar Upadhyay, Shama Sikander, Shruti Seth, Deepti Gujral, Karishma Tanna, Narendra Kumar, Amul Goel, Parul Mujumder, Ashleysha Yesugade, Sameer Belvalkar, Satyajit Joglekar, Saurabh Gadgil – CEO, PNG Jewelers and Vidya Tiwari, amongst others. EROS presents Super Star Rajinikanth and Deepika Padukone in the upcoming movie RANA. 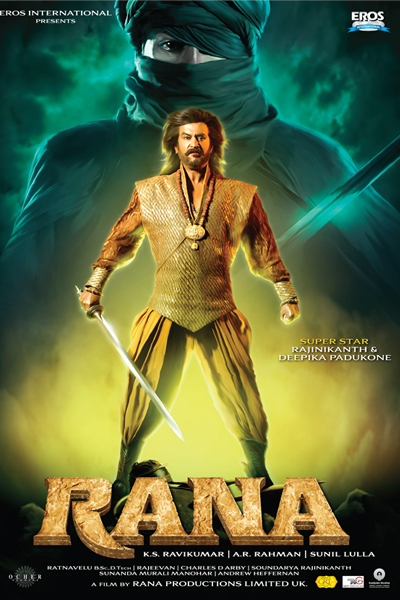 Eros International Media Ltd (Eros International), India’s largest integrated film studio has announced the commencement of the shoot of Rajinikanth’s ‘rana’ on 29 April 2011. Directed by K.S. Ravikumar, the film’s shoot will commence with a puja by Rajnikanth along with the cast and crew in Chennai to mark the auspicious occasion. Announced earlier this year, Rana will be a live action magnum opus with Rajinikanth playing triple role and will be released in Tamil, Hindi and Telugu. Along with Rajini, the film stars Deepika Padukone, Ileana D’Cruz and Sonu Sood. Speaking on the occasion, Director Mr. K.S Ravikumar said, “Rana has a strong story, a very interesting ensemble cast of actors coupled with super star Rajinikanth in a triple role and promises to have some stunning visual effects that will surely take Indian cinema to the next level. Mr. Sunil Lulla, Managing Director, Eros International Media Ltd added, “It is indeed a proud moment for us and we are very excited to be a part of this ambitious project with Rajinikanth, one of the most popular actors of all times. We are expecting this to be a landmark film for all those associated with this project”. The music for the film is being scored by A R Rehman, director of photography Ratnavelu and editing would be done by Antony. The technical director is Soundarya Rajnikanth, of Ocher Visual effects UK, a subsidiary of Ocher Studios Pvt Limited, and Charles Darby of Eyeqube Studios, renowned visual effects luminary and an Emmy award winner, is the creative and special effects director on the film. The film is scheduled to release in FY 2012. Eros International along with NextGen Films, will produce the film through Rana Production Ltd., UK. Student of H.R. College in Mumbai, Kanishtha Dhankhar is a model by profession. Her height is 5’ 9.5”, weighing 55 kgs with Vital statistics of 32- 25- 36. Kanishtha had earlier won the Pantaloon Femina Miss Body Beautiful award. Kanishtha has walked the ramp for Lakme Fashion Week, Wills Lifestyle India Fashion Week, Couture Week for many designers including Tarun Tahiliani, Manish Arora, Sabyasachi Mukherjee, and among others.